UMP | University of Minnesota Press Blog: Aaaaand we're back to the State Canvassing Board. As Minnesota's State Canvassing Board meets today to certify last week's close-but-not-close-enough-for-a-recount primary election results, one can't help but remember a time in 2008 when all eyes, locally and nationally, were turned to the State Canvassing Board. 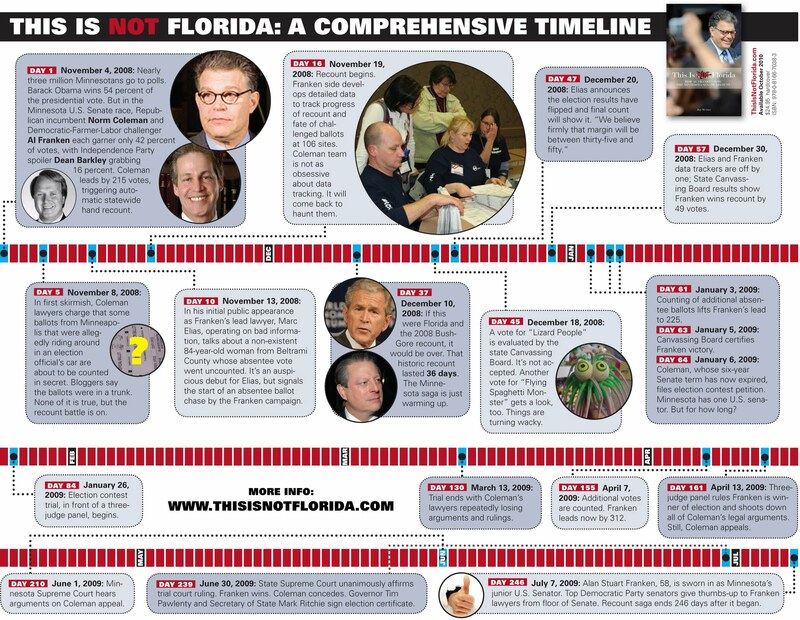 The University of Minnesota Press has compiled this infographic timeline that lays out all of the events surrounding the 2008 Coleman–Franken Minnesota Senate recount—the largest, longest, and most expensive election recount in American history. The Minnesota recount lasted about 35 weeks; the 2000 Bush–Gore Presidential recount, by comparison, lasted 36 days. For more information, check out This Is Not Florida: How Al Franken Won the Minnesota Senate Recount by Jay Weiner, forthcoming this fall. 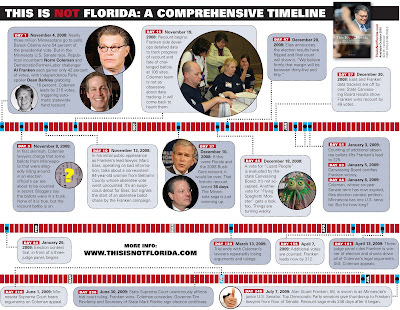 You can download a larger, PDF version of the timeline by clicking here.